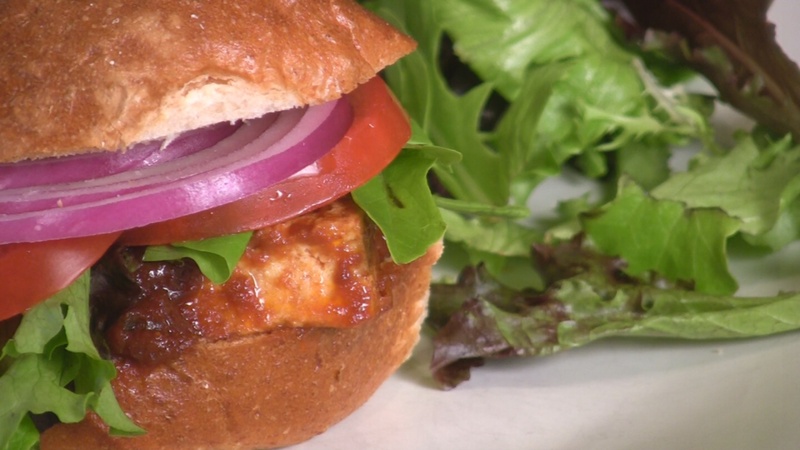 Here's a quick and easy way to spice up some tofu for a hearty, summertime sandwich. Great for the grill or a quick lunch or dinner in the fry pan. Slice the tofu into 1/4 inch slices. Put the tofu on a plate or in a shallow bowl and cover with the barbecue sauce. Let it marinade for 5-10 minutes. Warm the oil in a pan over medium heat. Add the marinated tofu and a little extra sauce. Cover and cook until it is warm. Serve on a whole grain hamburger bun with all of the fixings. This sandwich goes well with a green salad. Use the barbecue grill: Cut the tofu into slightly thicker slices, marinate and cook on the grill!